Life is infinitely more beautiful when you go through it with people you love and respect by your side. My friendships are one of the most important aspect of my life, and I am grateful every single day for the amazing friends I have. If you don’t know by now, relationships take work, even the best ones do. You can’t expect that it’s all just going to be a walk in the park. Maintaining healthy relationships takes dedication. It’s just like anything, the more you put into your relationships the more you will inevitably get out of them. Lee and I first started talking via Instagram in early 2016. I always admired Lee’s work and got a feeling we would vibe well together. Over the next year, we kept in touch and started talking about the potential of working together. We wanted to do some sort of event together and would have FaceTime dates to catch up and chat through ideas. Over the months, we talked several times, and we would always talk about how crazy it was that we still had never met. Finally in February of 2017, I decided enough was enough, and I was just going to fly down to LA in early March so Lee and I could finally meet in person. It was actually kind of hilarious because we would always joke that we were in a LDR (long-distance relationship), and I remember in the hours leading up to our meeting I felt nervous like I was going on a first date. We met at the Whole Foods 365 store in east LA, and when we saw each other from across the produce, we ran screaming with our arms flung wide towards each other. I’ll never forget it. It’s only been a year since then, but it honestly feels like Lee and I have been friends for a lifetime. We always say that we must’ve been friends in another life. Our connection felt very real and authentic right off the bat. This past year, we were lucky enough to work together, but we also made a solid effort to stay close. The first 6 months after we met, we saw each other almost every month. Like with all friendships, Lee and I have had our share of problems. No relationship is perfect. But through open communication, vulnerability, honesty and unwavering support, we’ve been able to work through the conflicts that have arisen, ultimately coming out feeling stronger and more connected together. It’s so important to be able to talk to the people you love and even though it is difficult to bring up conflict and be willing to talk through it and see another perspective. 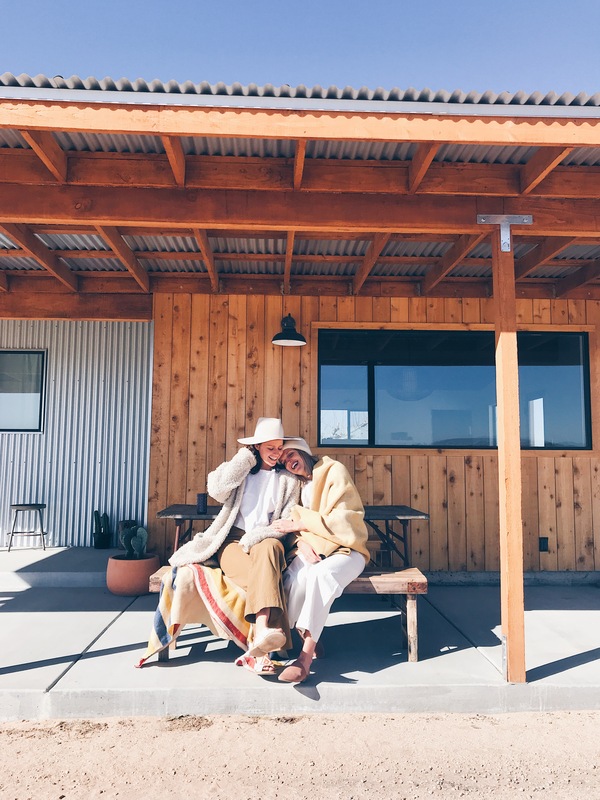 Lee and I decided to collaborate on this blog post when we were on a recent trip to Joshua Tree. 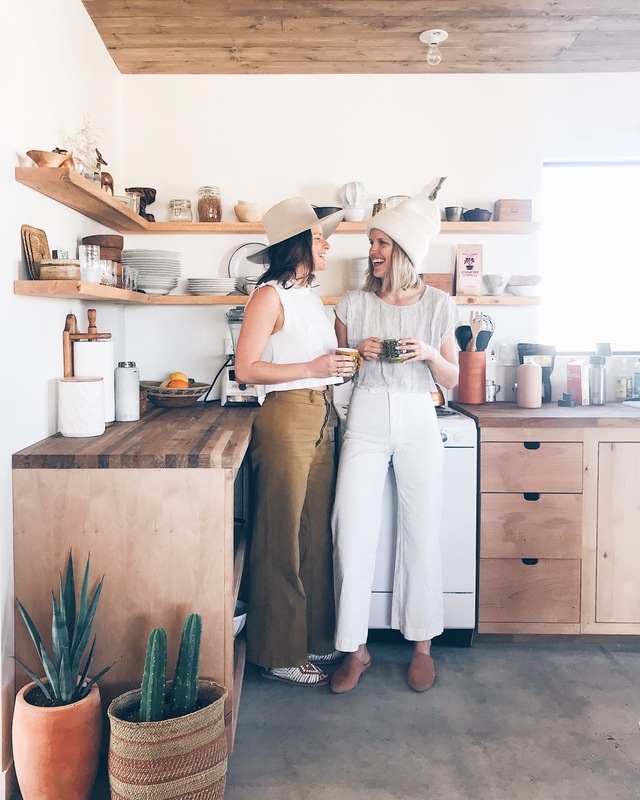 We wanted to share about our friendship and 8 qualities that we think help cultivate healthy friendships. Check out the other 4 over in Lee’s post. Being able to talk to one another and be open about feelings and situations that arise is so important. Without honesty, a friendship weakens. Feeling like you can’t tell your friend what’s on your mind ultimately leads to a lack of desire to want to spend time with them or be close with them. Often times, the hardest part is getting up the courage to say what you’re feeling out loud to the other person. I find that usually the reaction I think someone is going to have ends up being totally made up in my head. What’s friendship without fun?! I feel so grateful that Lee and I have had so many fun adventures together already, and some more exciting ones on the horizon(!!!). I definitely feel like Lee and I have a similar sense of humor. As friends, I think it’s so important to be able to laugh at the same things. To feel like you’re on the same frequency in terms of humor is a really, really good feeling. Sharing similar values and ideas about life is super helpful in cultivating a strong friendship. Although not entirely necessary, sharing similar values with a friend allows you to connect over common interest and mutual understanding. Lee and I value many of the same things in life and in our relationships. We share common interests which gives us ways we can interact together and strengthen and deepen our connection. This past year, we’ve participated in moon circles together, discussed the future and what our dreams are, took yoga classes together, made delicious healthy meals together and talked about political turmoil and social injustices. It’s inspiring and comforting to be able to connect with a friend over shared values and interest. Support is at the core of every thriving relationship. To have each other’s backs and to be there to encourage one another. Whether you’re making big life decisions or just need some extra attention, having a friend’s support can help so much. Being in the same industry, Lee and I have definitely had to deal with feelings of competition and comparing ourselves to one another. Ultimately, we’ve both found that collaboration and support trump competition and insecurity. When we are able to lift each other up and fully support what the other is doing, we ultimately stand more fully in our own power. 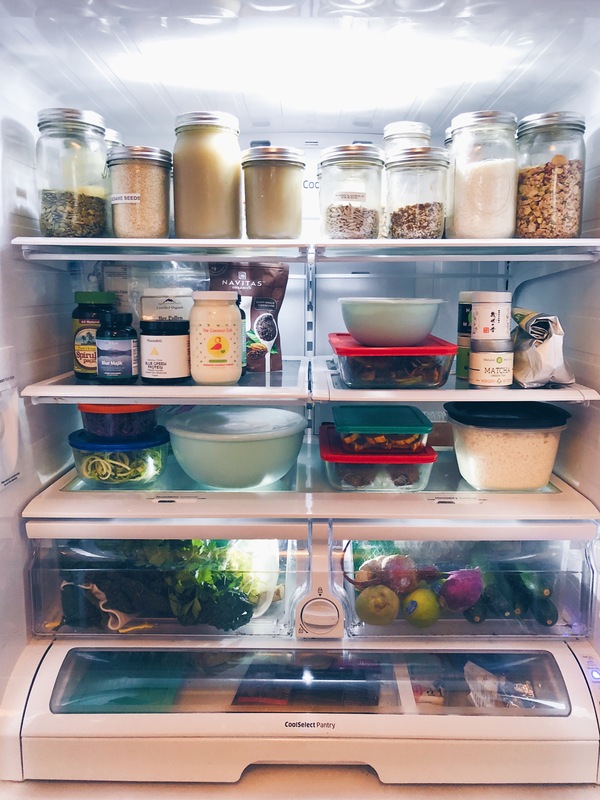 I get countless questions on what I keep stocked in my pantry, and I’m finally telling all! 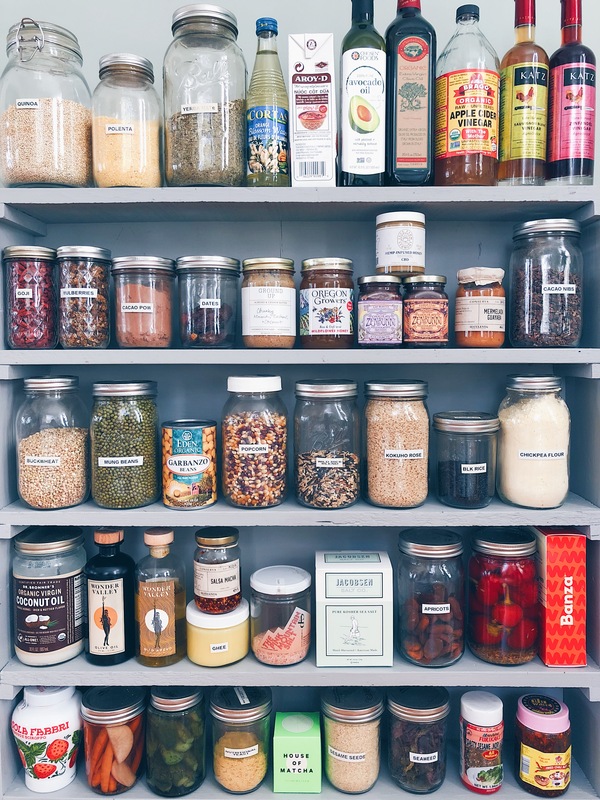 I enlisted the help of my dear friend, Shannon Sims, to help me replicate my pantry on a shelf we painted and set up in my living room (TRUE CONFESSIONS!). The Wu Haus Kitchen is going through a remodel right now, so I couldn’t share my actual pantry, which is a bunch of bins packed full with dry goods that are currently being stored in my dining room. 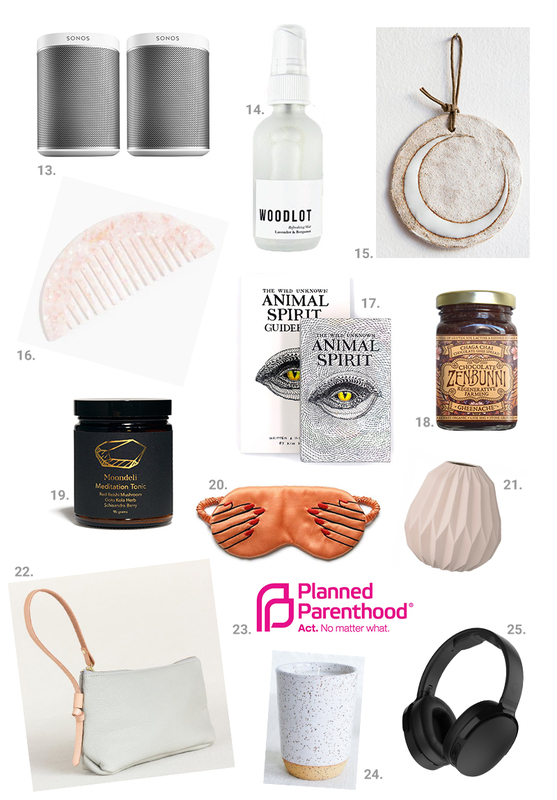 Anyways, I’m excited to share with you the items I always keep on hand at home. As you can tell from the photos, I favor buying in bulk and storing everything in reusable jars. I’ll be doing a similar post with what I keep in my spice cabinet in the next couple months, so stayed for that! One of my favorite foods on earth. I could seriously survive on olive oil if I had to. I usually have a few varieties in my pantry. Read my top tips for choosing, storing and using olive oil. If you know me, you know how obsessed I am with coconut butter. I use it in my matcha every morning and for moon milks in the evening. It’s also great in smoothies. I buy it in bulk because I move through it so fast. I also always keep coconut oil around for cooking and to use in raw treats, bliss balls and baking. My go-to cooking oil. I usually keep 2 bottles on hand at all times. This is the brand I prefer. I love ghee. I don’t use it as much as avocado or coconut oil, but I still keep it stocked in my pantry at all times. I love using it in golden milk tea lattes. It is super simple to make, just follow this tutorial. Salt may be my favorite ingredient next to extra-virgin olive oil. I love it so much that I usually have 5 different kinds on hand at all times. I love Jacobsen kosher sea salt, pink Himalayan salt, Maldon finishing salt, fleur de sea, sel gris and infused salts like the copal salt I just picked up on my recent trip to Oaxaca. Canned beans are my favorite “I’m lazy and didn’t plan dinner” item to have on hand. Dried beans are great if you want to make a big batch of beans for the week, or if you’re making homemade hummus. Beans are fiber-rich and a good plant-based source of protein. Literally can never have too much matcha. I keep my pantry stocked with a few extra tins just in case I run out of my supply in the fridge. [Note: In case you missed it… Matcha should always be stored in the refrigerator after opening to preserve the flavor.] This brand and this brand are my favorites. I love dates SO much. I use these in my bliss balls, and occasionally I throw one in my matcha or moon milk if I’m feeling like I want some sweetness. Always go for organic, unsulfured apricots. They will be brown in color, not bright orange like you may be used to. I top these with a little of my favorite nut butter, and this is my go-to sweet treat. I really don’t know what I did before Banza came along. I love this chickpea pasta so much. I always keep a few boxes on hand for easy weeknight dinners or to cook and add to lunch salads. If you didn’t know, I’m obsessed with socca (chickpea flatbread). See here, here and here. Socca batter is SO easy to whip up. It’s literally just one part chickpea flour and one part water whisked together and seasoned with salt and pepper and a couple glugs of avocado oil. Let the batter stand for at least 30 minutes before making your socca. You probably know how much I love this nut butter by now. I seriously can’t get enough. I drizzle it over yogurt bowls or eat it smeared on a banana for a simple snack. I don’t use much honey or sweetener in general, but I always keep honey on hand. I use it occasionally in raw treats, as well as in an apple cider vinegar tonic when I’m feeling the first signs of a sore throat. ACV is basically like coconut oil in that it has SO many uses. I’m a strong believer in the magically healing properties of this stuff. I use it in wellness tonics, salad dressings, for quick pickled veggies, and my husband even uses it as a hair rinse. I’ve been eating less grains these days, but quinoa is definitely my go-to grain (although it’s technically a seed). It cooks up in 18 minutes and is so nourishing and satisfying. I opt for the sprouted kind since it’s easier on the digestive system, or if you want to save money, just soak your quinoa over night, drain, rinse well and cook. I recently discovered this stuff, and I’m completely obsessed. It’s basically a replacement for coconut milk that doesn’t have any gums like the canned stuff does. I use it for homemade curries, raw treats and occasionally I’ll use it in my matcha if I have leftovers from making a curry this night before. Since it doesn’t have any preservatives, it spoils pretty quickly after opening – 2 days. My love for cacao knows no limits. This magical plant food has more antioxidant flavonoids than any other food on the planet. The nibs are delish ground up in smoothies, topped on yogurt bowls or in my Golden Chip Bliss Balls. From homemade tahini to dukkahs, sesame seeds know the way to my heart. I love using them in both sweet and savory preparations. Toasted sesame oil packs a flavor punch and is so great for drizzling over Asian-inspired salads. As you may (or may not) have noticed, cannabinol (CBD) is majorly trending in the wellness space as of late. It’s prized for its anti-inflammatory properties and acting as a natural pain reliever, as well as helping with anxiety and depression. The thing about CBD is that because cannabis is still illegal in most places there is not much clinical research out there on its actual benefits. 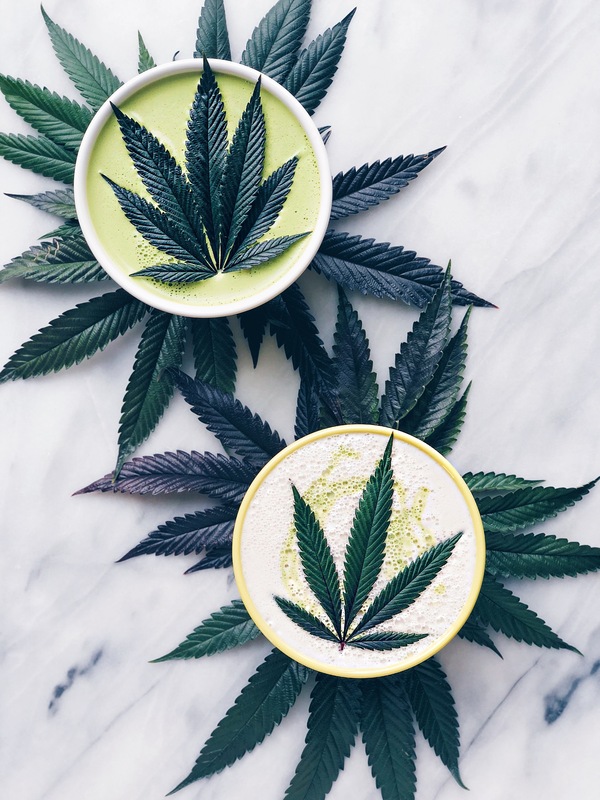 I asked Anja Charbonneau, the Editor-in-Chief of Broccoli Magazine, to help break down CBD and what we know about it (see a few paragraphs below). As she points out, most of the information we have is based on anecdotal evidence. In the spirit of that, I’ll share my experience with taking CBD. I started taking CBD in early November. I’ve been taking it pretty consistently since then (except for a 10-day break when I was in Mexico), and I’ve noticed changes in my stress/anxiety levels, joint inflammation and my sleep. When I’m taking CBD, I sleep way more soundly. Falling asleep is a breeze, and once I’m sleeping it’s a very deep sleep. I’ve also noticed my body reacts less to stress. I love using CBD as a way to wind down from my day or when I’m feeling overly nervous, anxious or stressed out. Lastly, I’ve struggled with joint pain and inflammation for years since an 8-day stint in the hospital with a systemic joint infection in 2011 that left me unable to walk for a month. I’ve noticed that when taking CBD, my knees don’t bother me as much from day to day, as well as in my Barre3, yoga or Backbody Project classes. I mainly use the oil in my daily matcha potion or my evening Moon Milk. 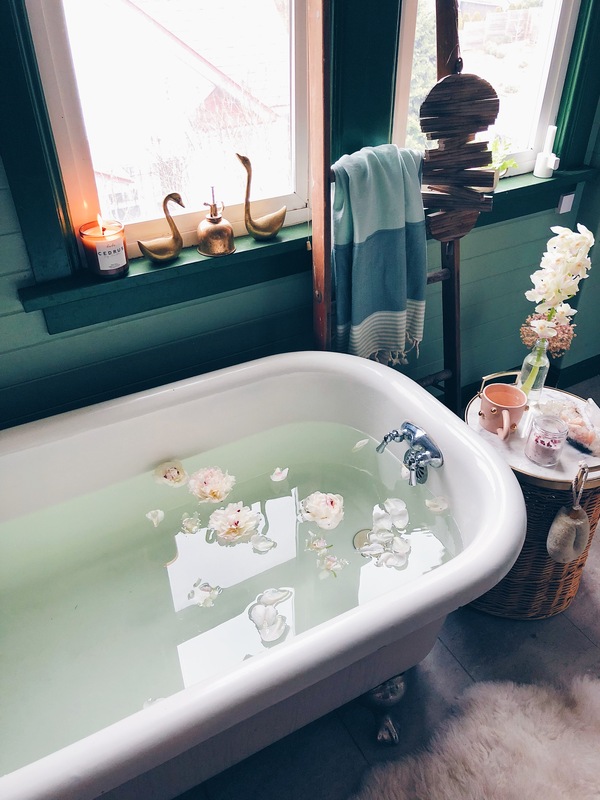 I’ve also been hearing amazing things about CBD bath products, so I’m dreaming of a cannabis-inspired bath in my near future. From nut milk to infused honey to face and body lotion, CBD is in everything these days. I’ve rounded up some of the best products out there (see bottom of post) based on recommendations from trusted sources and products that are on my list to try. It seems like there is a product out there for everyone. Cannabidiol – aka CBD – is one of many naturally-occurring compounds that exist in the cannabis plant. It’s closely related to THC, but with a special twist: CBD won’t get you high. 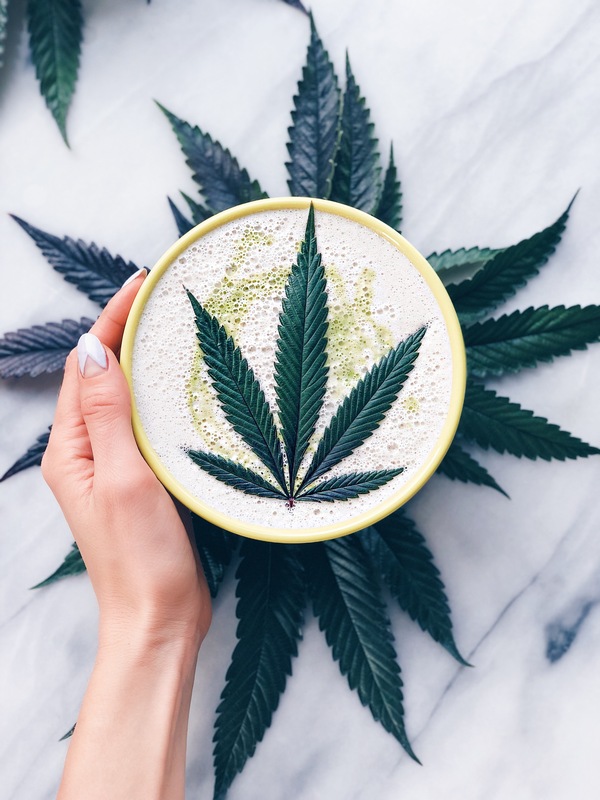 Cannabis is gaining recognition for its health and wellness benefits, but depending on your state’s cannabis laws, products with THC may not yet be a legal option for you. Plus, you might not want to get stoned, and CBD-based products can offer these benefits without the high. Cannabis is still classified as a controlled substance in the US, preventing most clinical research surrounding cannabis and health. Until that changes, we’re relying on anecdotal evidence to understand the healing properties of the plant. But, the anecdotal evidence is strong: many people use CBD products to help with chronic pain, headaches, anxiety, depression, and insomnia. 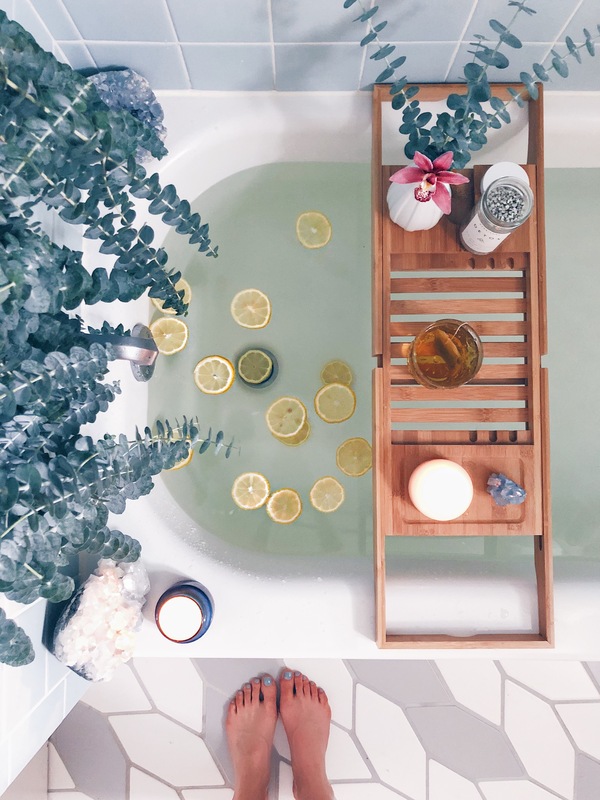 It is also becoming a popular ingredient in beauty and skincare products, mostly due to anti-inflammatory qualities—you can even find CBD bath bombs, eye masks and lip balms. If you live in the US and are interested in trying CBD, we recommend companies like Mary’s Nutritionals and CW Hemp, who are nationally recognized for their quality and source their CBD from local growers. Both companies offer a wide range of products. For a topical product like a balm or lotion, 25-100mg of CBD per bottle is fairly common. For tinctures and oils that you ingest, higher potency options are available, up to as high as 3000mg of CBD in a small bottle. Which one is right for you? We recommend starting small, and if you aren’t seeing the results you want, try moving to a product with more CBD per fluid ounce. Overall, we recommend learning about the body’s endocannabinoid system, so you can better understand how the human body reacts to things like THC and CBD. Beyond that, look for companies that use locally sourced CBD from trusted farms, and share your personal CBD experiences with others who are curious, because anecdotes and personal stories are the best tool we have for sharing knowledge while cannabis is still widely illegal and stigmatized. Luce Farm CBD Honey – Vermont honey infused with the good stuff. One of my favorite brands for CBD products. Upstate Elevator Supply Co. – This whole line. They even have dog treats! This is my other favorite CBD brand. Highly recommend the CBD MCT oil. Cosmic View CBD Tincture – Be sure to choose a non-pyschoactive option unless you want to get high. CW’s Everyday Advanced Hemp Oil – Great oil to take as a daily supplement. Would work great in coffee or matcha. Wildflower CBD+ Capsules – Capsule form makes it easy to take and easy to travel with. Wildflower CBD Vaporizer for Immunity and for Aches – Blended with essential oils for refreshing, great tasting vape pen. The Alchemist’s Kitchen Concentrated CBD Oil – Highly concentrated. Modern Medicinals CBD Oil – If you’re local to Oregon. Support local business and growers. Apothecanna Extra Strength Body Creme – Great for sore muscles or distressed skin. Wunder Workshop Turmeric CBD – A double dose of anti-inflammatories. For me, January is all about turning inward, focusing on myself, setting intentions and goals for the coming year and practicing daily self-care. 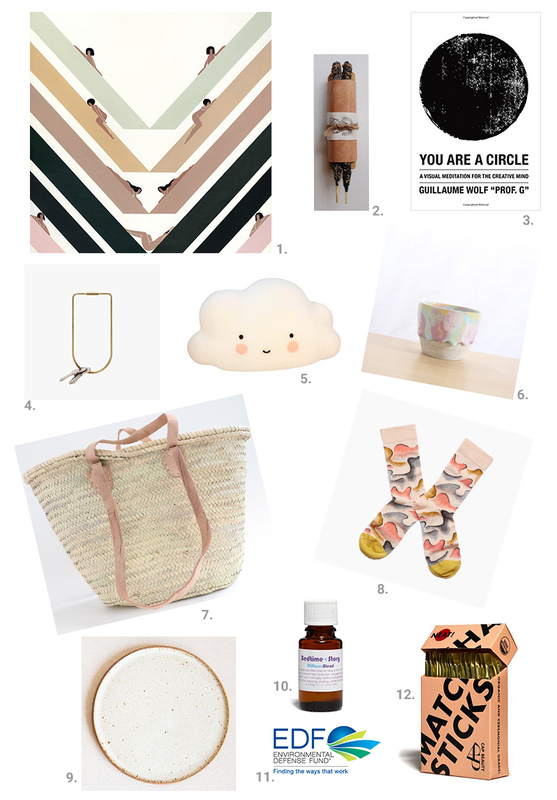 I’m so excited to collaborate with Anthropologie on this month’s #ABetterYou campaign. You can read some more of my thoughts over on their blog. This campaign is all about creating daily healthy habits that will hopefully inspire you to be the best version of yourself in 2018. Below, I’m sharing 3 recipes that I hope you will try at home this month. I encourage you to be gentle and treat yourself with love and care over the next couple weeks. Whatever that means to you. Maybe you take a couple days off social media, maybe you take a relaxing bath 3 days a week, maybe you start that meditation practice you’ve been thinking about, maybe you commit to exercising more consistently, maybe you cook vegan or vegetarian one day a week. This is a potent time of year for setting intentions, creating habits and getting clear on what you want and need. As always, I’m here to support and encourage you. I’d love to see how you’re showing yourself love and extra care this month and what healthy habits you’re working on. Tag your photos with #ABetterYou on Instagram and/or comment below. 1.) 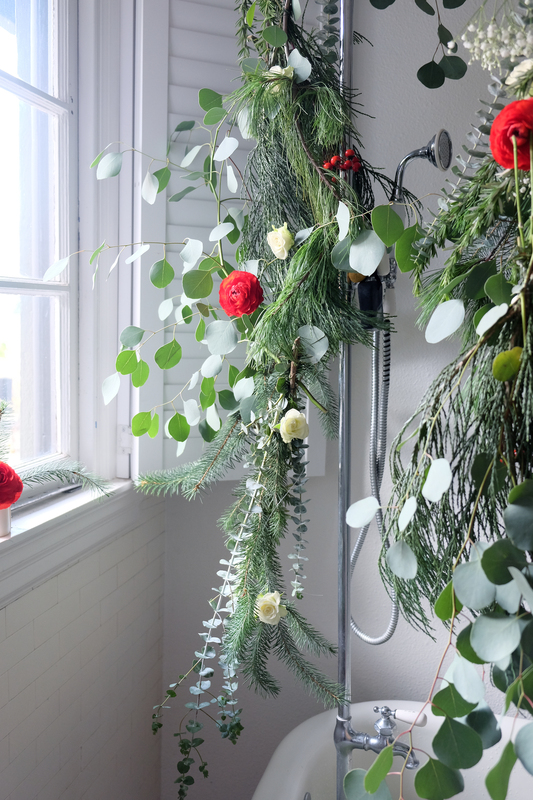 Tie bunches of eucalyptus around the faucet handles in your tub. 2.) Fill bath with hot water. 3.) 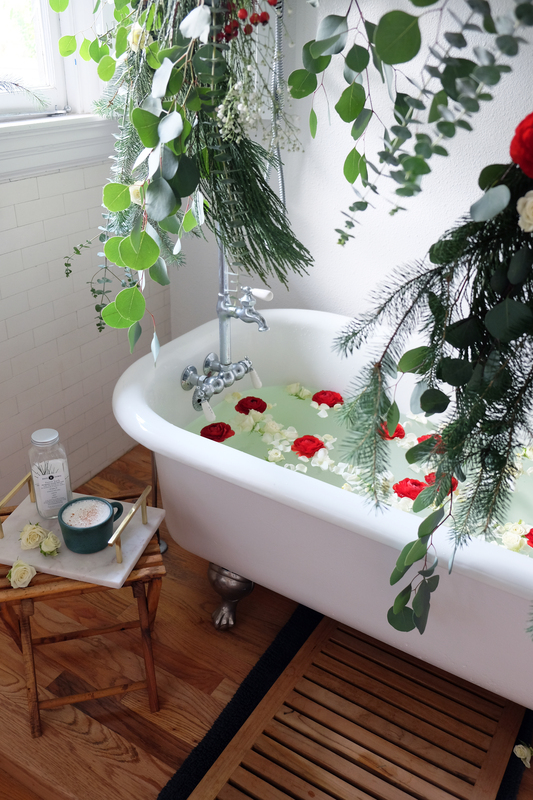 While bath is filling, place candles, crystals and anything else you’d like around the tub. 4.) 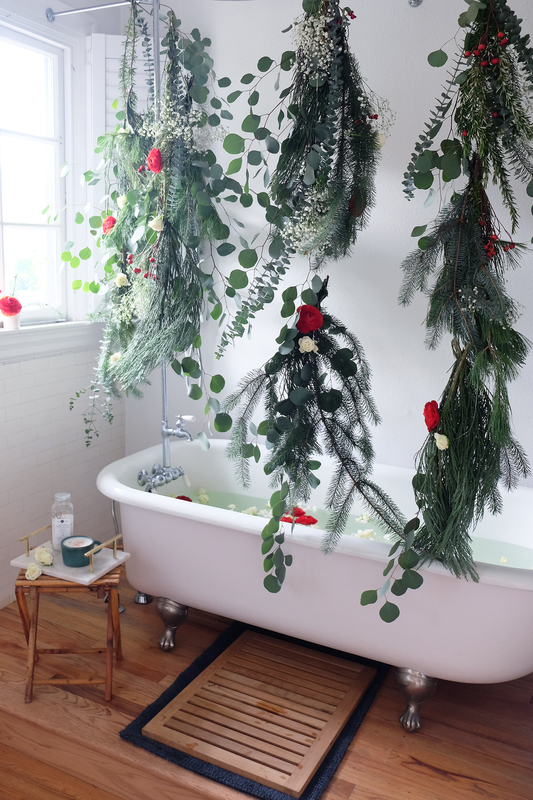 Once the bath is mostly full, with the water running, add a couple handfuls of bath salts. 5.) Turn off the water. Float the lemon slices in the water. 6.) Light the candles. Grab a cup of tea or water and a book if desired. Turn on relaxing playlist. 7.) 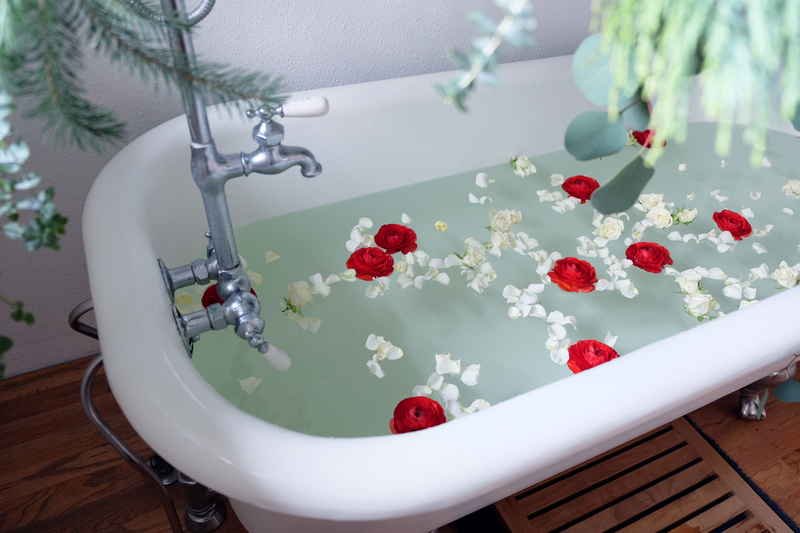 Soak, relax, rejuvenate, enjoy. 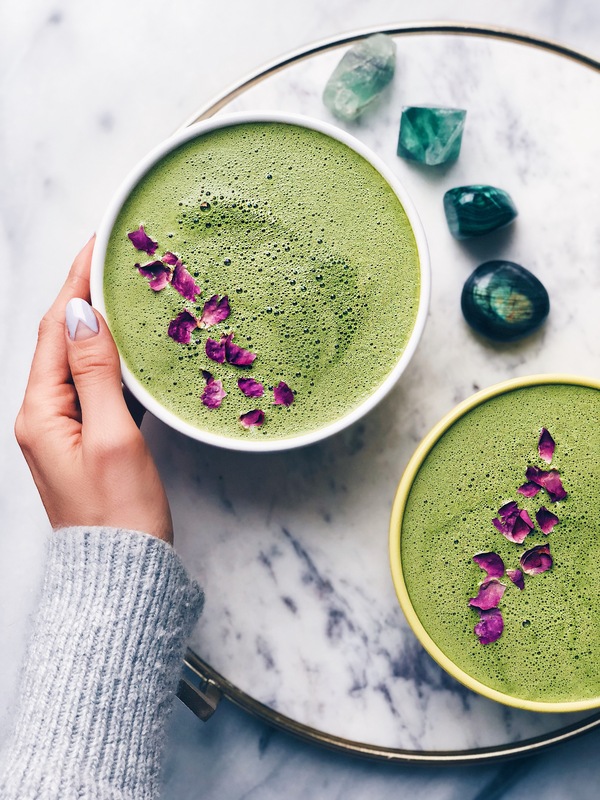 Find my favorite matcha recipe, here. 1.) Blend all the ingredients for the base on high in a high-speed blender until very smooth. Pour into a bowl. 2.) Top with some of the topping and fresh or frozen berries if desired. Just after Christmas, I got together with my friend Sasha to collab on an Ayurvedic immune-boosting soup recipe. Sasha is the brains and talent behind the insanely gorgeous food blog, Tending the Table. 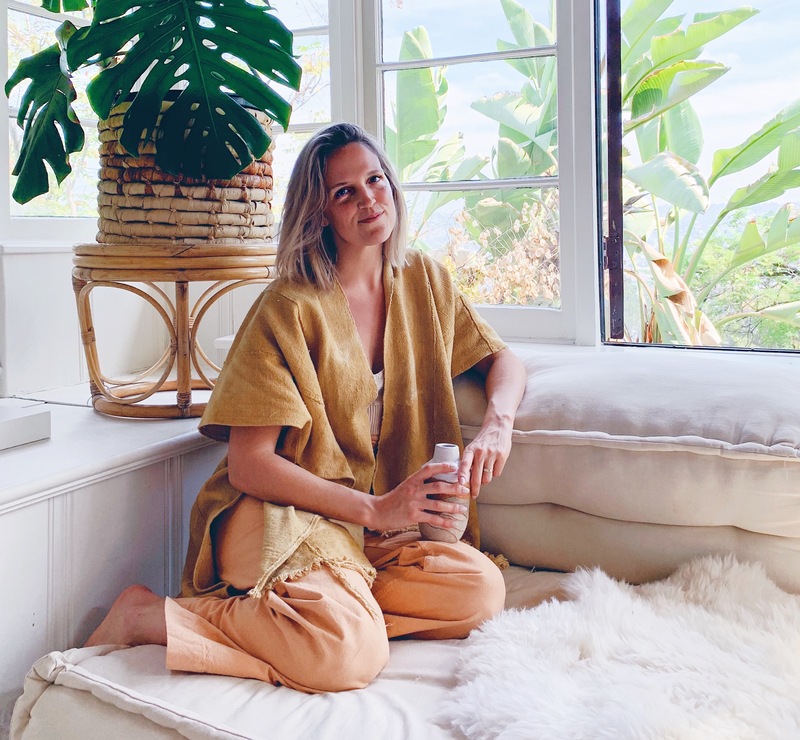 I’ve long been inspired by Sasha’s beautiful photography, her commitment to sustainability and her knowledge of Ayurveda. If you don’t follow her already, I highly recommend checking out her work. We’ve known each other for many years through a mutual friend, so it was lovely to finally work on a recipe together. 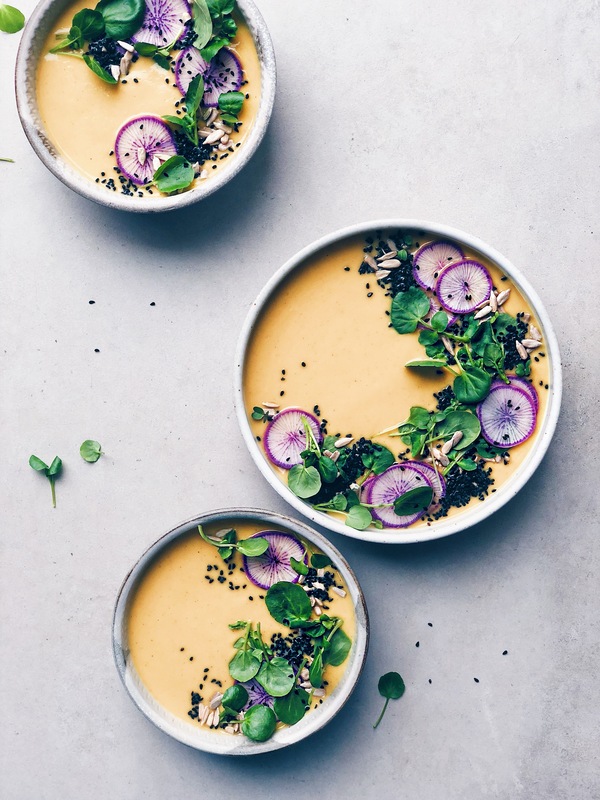 This soup is not only delicious, it’s nourishing and strengthens immunity, making it perfect for sipping during these coldest winter days. In Ayurveda, and in Yoga, there are three subtle essences responsible for all physiological and psychological functions; Prana, or life-force, Tejas, or transformation, and Ojas. Ojas is the subtle essence of strength, vigor, resilience, longevity, and immunity. It’s responsible for that radiant glow, vibrancy and vitality that we’ve all seen in others and wanted for ourselves. According to Ayurvedic philosophy, the body takes 30 days to create Ojas through the process of healthy digestion. 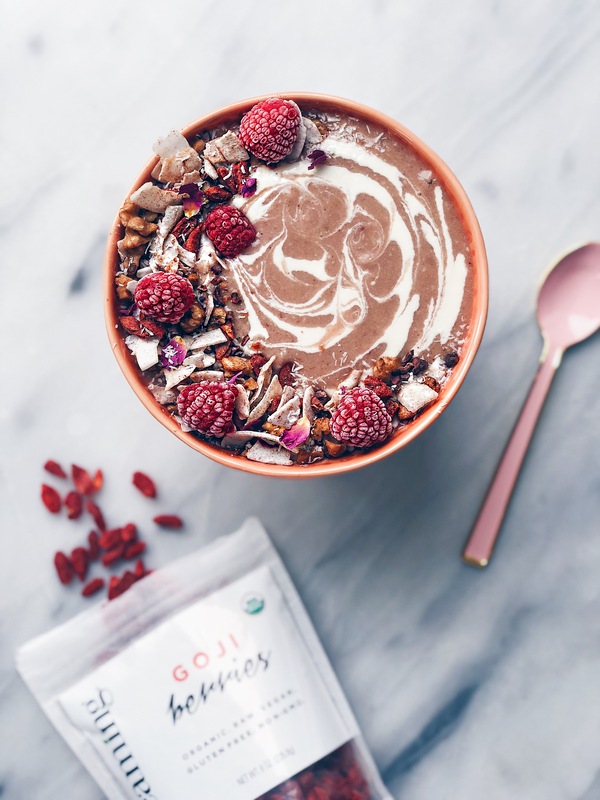 For a more detailed description of this process check out this article and to learn more about how to promote healthy digestion from an Ayurvedic perspective, check out this post from last year. 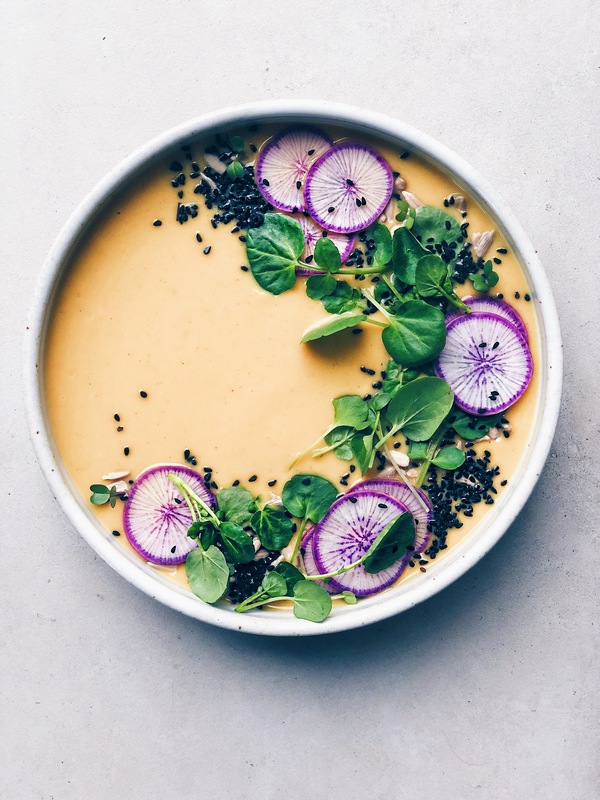 This soup also includes ashwagandha and shatavari – two powerful Ayurvedic adaptogens. Ashwagandha is especially useful for dealing with stress in the body and promotes an overall sense of well-being. Stress is one of the largest contributors to sickness and disease. 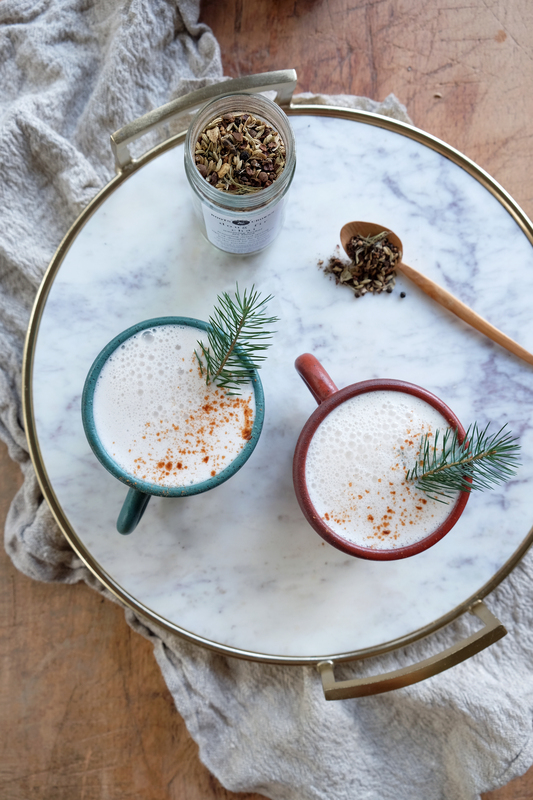 Adaptogens help our body cope with emotional, environmental and physical stress. They are best taken in small amounts over long periods of time. Shatavari specifically helps the body build Ojas. It is especially useful in calming the nervous system, nourishing the brain and helping with overall balance in the body and brain. 1.) Preheat the oven to 400° F. Toss the cauliflower and celeriac with the oil and ½ teaspoon salt. Spread evenly on a rimmed baking sheet and roast for 30 minutes, until tender when pierced with a knife and beginning to brown. 2.) Meanwhile, heat the ghee in a large pot set over medium heat. Saute the shallots, ginger and turmeric with 1/2 teaspoon salt and black pepper until soft. Add the roasted cauliflower and celeriac, the coconut milk and vegetable broth and simmer for 5-10 minutes. Add the shatavari, ashwagandha and lemon juice. Mix thoroughly. 3.) Transfer to a high speed blender. Puree on high until completely smooth. Add more salt and/or black pepper to taste. Serve warm garnished with sliced radishes, watercress, sunflower seeds and nigella seeds. I decided kind of last minute and on a whim that I wanted to do some sort of cleanse post holidays and Mexico travel. I looked into Whole30‘s basic rules, and decided to follow similar guidelines. For the month of January, I’m eliminating sugar, grains, diary, legumes, eggs and alcohol. I’m not a huge fan of some of the language and “rules” of Whole30, but I like the basic guidelines of their cleanse. I created the #Wu30 hashtag to build a community of my followers who are cleansing for the month of January. I’ve opened up this group to people strictly following Whole30, vegetarians and vegans and anyone else who may be following a modified version of the cleanse. Most importantly, I want to encourage you to do what is best for you. I’ve chosen to eliminate eggs because they don’t agree with me. I’ve also chosen not to take a hard stance on some of the rules and mentality behind the Whole30 plan. Ultimately, you do you! You are the only person who knows what is best for your body, what foods you may use as crutches and what kind of cleanse is right for you. Trust yourself and what your body (not your mind) is telling you. This week’s meal prep includes roasted chicken, lamb meatballs (literally just local grass-fed ground lamb, chopped dill, basil and S&P rolled into balls, browned in a skillet on the stovetop and then finished in a 350° oven for a few minutes), roasted delicata squash and rainbow carrots, homemade bone (or veggie) broth (recipe here), romesco sauce, purple sweet potato and zucchini noodles, my go-to mustard salad dressing, mixed lettuce and radicchio, homemade almond butter and cauliflower rice. Also prepped, but not pictured: homemade coconut and Brazil nut mylks. These are just the items I’ve prepped ahead of time (or made from scratch) to make it quick and easy to create meals for the workweek. Of course, I’m supplementing this with other fresh veggies, fruits, seeds, nuts and fresh seafood. My protein breakdown for the week is as follows: Chicken 5 meals a week, seafood 3 meals a week, lamb 2 meals a week and the rest plant-based options. Of course, if you’re not eliminating eggs, you could certainly add those in as a protein source. If you are doing the cleanse vegan or vegetarian and aren’t eliminating legumes, you could prep some roasted garbanzo beans, as well as making a big pot of whatever your favorite bean is. I’ve been doing smoothies as my breakfast everyday, and I’m happy with how I feel so far. On the weekends, I might switch it up and do a sweet potato hash or chia pudding. Cauliflower rice (heated in a skillet with some avocado oil over medium-high heat for about 5 minutes or until slightly browned), roasted chicken (recipe at the end of this post), roasted carrots, arugula, preserved lemon and romesco. See inspiration here. Bone broth soup with sweet potato noodles and other veggies. See inspiration here. 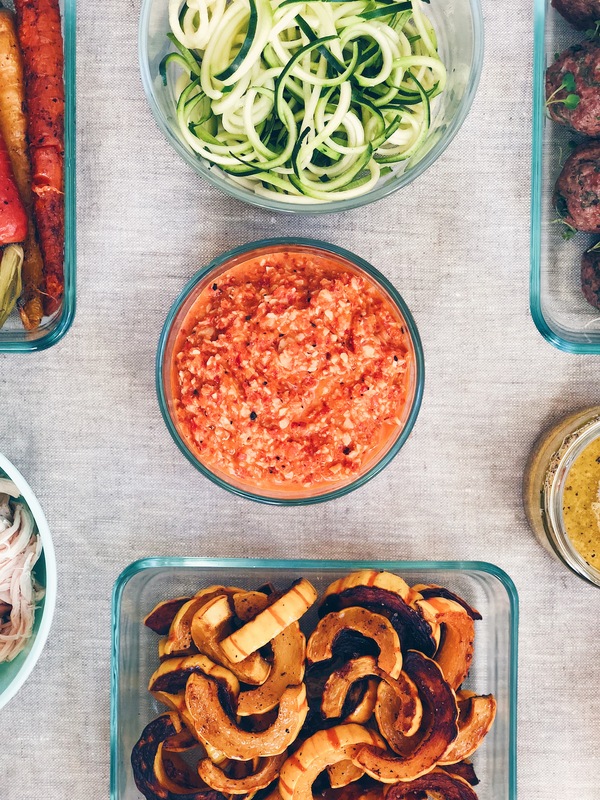 You could add a pesto and a few other sauces to your meal prep mix to have some variety to play with. I’m planning to make a few pesto variations that I hope to share in the coming weeks. I also have 2 new recipes planned for the blog for next week, so stay tuned for those! Also planning to share my weekly meal prep on Instagram for the remainder of the cleanse to give you guys an idea of what I’m eating week to week. Be compassionate with yourself. And take it easy! Remember you are cleansing. It’s not necessarily going to be all good all the time. It can be frustrating. Emotions can come out. You may feel like you don’t have the energy you normally have. And that’s all okay. Notice how you’re feeling, what emotions come up and how you respond to the cleanse overall. All of these things can teach us a lot about who we are as people. Take it all in, be easy on yourself and remember how amazing and brave you are for even getting this far. This helps take the guess work out of what you are going to eat from meal to meal. When you’re cleansing or eliminating certain foods and are eating a diet that is different from what you normally eat, the last thing you want to be is starving when you’re trying to figure out what to make for lunch everyday. 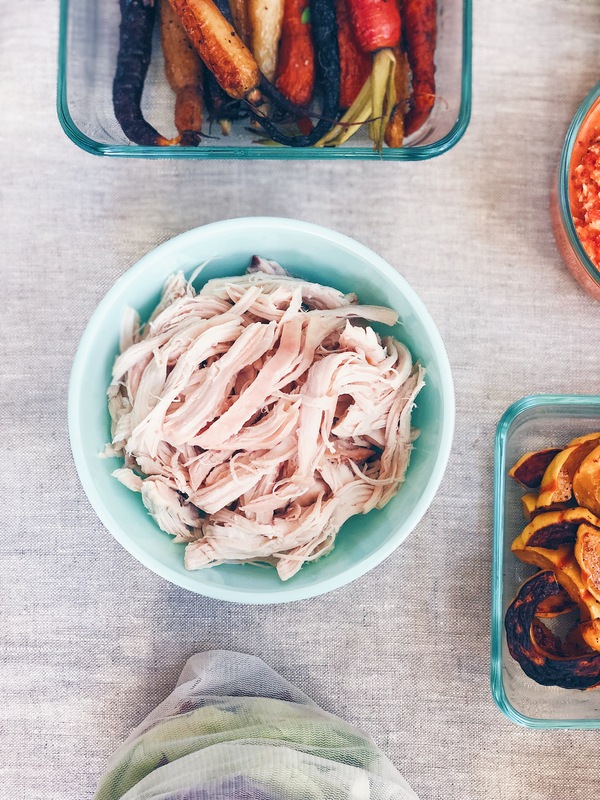 I don’t plan out exactly what I’m going to eat for every meal, but the meal prepped items help and then I have about 3-5 meal ideas beyond the meal prepped items that I want to make that week. This is key for me. If you’re feeling lower energy, try a restorative or yin yoga class (remember tip #1!). If you are feeling more energetic, feel free to go for your normal workout routine. I’ve done so many cleanses over the years that I’m at a point where for the most part I can go about my typical routine, but of course I have days where I need to be way more gentle with myself and not workout at all. I think committing to a 5-10 minute meditation practice everyday (preferably in the morning to start your day) is a great tool for success. Meditation allows me to ground and center. After meditating I feel way more in my body and ready to take on whatever comes my way. If you’re looking for an at-home movement + meditation, try the video Kait and I just released. Hydrate! Water and herbal tea. Drink more water than you normally do. I also love to drink more herbal tea than I normally do. I usually have 3-4 cups a day when I’m cleansing. It can be great to incorporate teas with herbs for liver detoxing as well as herbs that aid in digestion. Traditional Medicinals, Mountain Rose Herbs and Pukka both make great blends. Seriously. Self care like never before. I already have plans to soak and sauna both days this weekend. If you have the means, soaking, saunaing, acupuncture, cupping and massage are all great to do while cleansing. All promote relaxation while helping the body release toxins. At home, I’m dry brushing everyday and taking baths 2-3 times a week. Overall, try to give your body some extra love. Whatever that means for you. Ease off the cleanse. Don’t just dive right back into old habits. Tendencies are to jump right back into old eating habits immediately following the cleanse. I can’t stress enough how important it is to take it slow. Give your body a chance to process the new things you are throwing at it. Slowly start to reintroduce foods, one at a time. This will also be helpful in finding out which foods, if any, trigger digestive upset or any other symptoms in the body. 1.) Pulse all ingredients in a food processor to desired consistency (should be chunky and crunchy still). 1.) Whisk all ingredients together. Store in an airtight jar on the counter for up to 3 days. 1.) Allow chicken to come to room temperature before cooking – leave out on counter for 30-45 minutes. Preheat the oven to 250°. 2.) Pat chicken dry with paper towels. Using a knife, make a slit on one edge of the skin. Peel open skin (but do not remove) and generously sprinkle and work salt onto the meat under the skin before covering the meat again with the skin as it was. 3.) Roast chicken pieces on a rimmed baking sheet for about 2 hours or until a thermometer reads 165°. Remove from oven and allow to rest for 10-15 minutes before shredding meat. Discard skin. Save bones for bone broth. Store chicken in an airtight container in the refrigerator for 3-4 days. You can also freeze the chicken by placing the meat in a container with bone broth. Chicken and broth are safe in the freezer for up to 9 months. 2018! I’m so ready and excited for you. Over the past couple weeks, I’ve been working on a list of intentions and goals for this year. I’m sharing some of those below. Instead of just sharing what my intentions are, I decided I wanted to list the goals I have that will help me be successful. The goals are more actionable items while the intentions are the overarching idea I want to bring into my life. 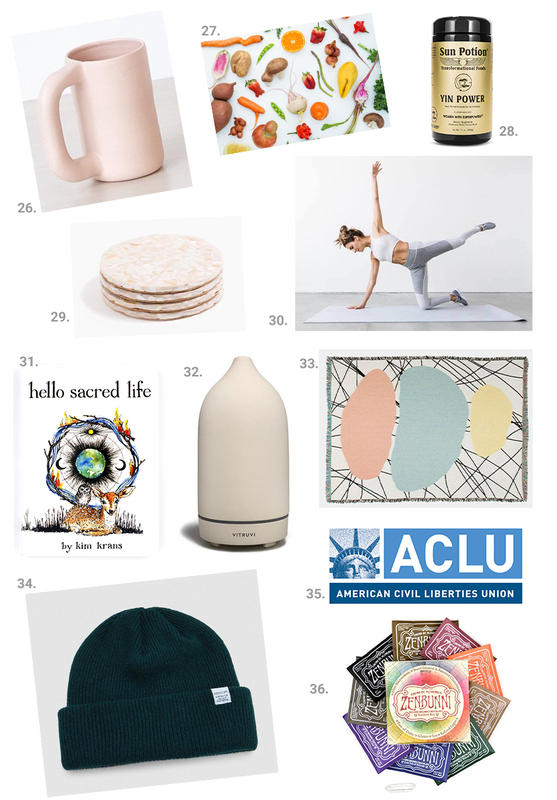 I hope this list inspires you to set some intentions for the coming year. Your intentions and goals don’t need to be crazy, unachievable items. They can be as simple as going on a walk once a week, or calling your mom every Thursday. Overall, intentions remind me to keep pushing and keep reaching to be better, to be the best version of myself that I can be. Happy New Year and Full Moon in Cancer! This one is so important for me this year. After spending a couple days off the grid in early December, I was reminded how beneficial and necessary it is to disconnect and take a break from social media (and email). To reconnect to my inner teacher and to the rhythms of nature. To more strongly connect with the most special and important people in my life. I’m aiming for 2-days-off in a row unless something that month prohibits me from doing so, in which case I’ll still take 2 days off just not consecutively. My girlfriends and I started a book club in 2017, so this definitely helps motivate me towards my goal of one book per month. Really one book per month isn’t much at all, and I hope to increase that number with time. I’m starting a list of books I want to read, so if you have any favorites I should add to my list, please leave a comment on this post with the title and author. Intention: Give my body and digestive system a reset after the holiday season and traveling to Mexico. Goal: #Wu30 cleanse for January. Giving up sugar, grains, legumes, dairy and alcohol for 30 days in January. Ideally I would like to do some sort of cleanse 2-3 times a year. I used to do juice cleanses, but I haven’t done one in a couple years. For the warmer months, I might consider doing another one, or doing another #Wu30 later in the year. For me, it’s so important to give my digestive system a break and after a month of indulging and eating foods that don’t make me feel the best (usually when I’m traveling or around the holidays) doing a cleanse is the best reset. 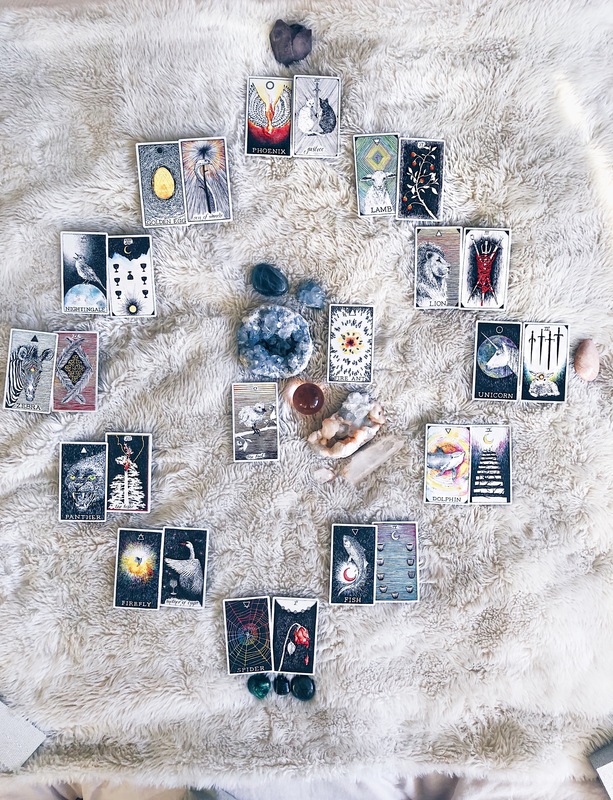 Intention: Consistent full and/or new moon ceremonies. Goal: Host at least 3 ceremonies, and write in Many Moons workbook every month. In 2017, I participated in several full moon ceremonies, but I want to be more consistent about it this year. I hosted one last year, but my goal is to host 3 in 2018. I also want to practice ceremonies on my own for new and full moons when I don’t have a group of women to participate. I’m using the Many Moons workbook this year to help keep me consistent. This moon journal is a great guide if you are interested in this sort of ritual or ceremony. I’m also working on a blog post that teaches you how to create your own monthly moon ceremonies, so stay tuned for that! Intention: Approach conversations, confrontations, situations with patience, respect and love. Goal: Less defensive. Less reactionary. Take a few deep breaths or step away before responding/reacting. I went a bit into this in my Instagram post, but overall I want to work on improving the way I respond to the circumstances in my life. I want to take notice when I get defensive or when anger arises from a conversation or confrontation. My goal is to learn to take a step back, to disassociate my reactions from my being, to be able to calm down before I respond or react. Intention: Strength long-distance relationships. Goal: Call and FaceTime with family and friends 1 time a week. I’ve noticed I use text as the main way to correspond with my friends and loved ones who live far away from me. I want to strengthen these relationships by committing to more conversations via phone and FaceTime. Intention: Continue to embrace and accept my changing physical body. Goal: Self-care practice 3-4 times per week. This intention will be one I have year after year. Aging gracefully is a challenge. I feel so grateful that I have so many amazing women in my life to look up to and learn from in this regard. I’ve found I feel the best and am able to honor and love my body where it’s at when I practice weekly self-care. Having a network of strong, supportive women helps, as does physical exercise, meditation and repeating daily loving mantras to myself. Intention: Buy locally as much as possible. Goal: Limit Amazon orders to 1 time a month. I’m SO sick of all the packaging and waste that comes from ordering online and receiving shipments. Unfortunately, some of it goes along with my job as a blogger, but I want to make strides to order less online and only accept free product from brands that I love. It’s so easy to just order things on Amazon when you’re in a pinch, but I want to limit to ordering only once a month (less if possible). I’m going to make a running list of things I need to order and place one order at the beginning or end of the month instead of several times throughout. And of course, if I can get it locally, that is my first choice. Dry shampoo is a staple in my beauty cabinet. I only wash my hair 1-2 times a week, so dry shampoo is a savior on days in between washing. My hair is naturally very straight, smooth and overall pretty oily at the roots. For this reason, dry shampoo works wonders for me. Not only does it soak up excess oil, but it also gives my hair some texture and much needed body. I highly recommend it for people like me with very straight and smooth hair. 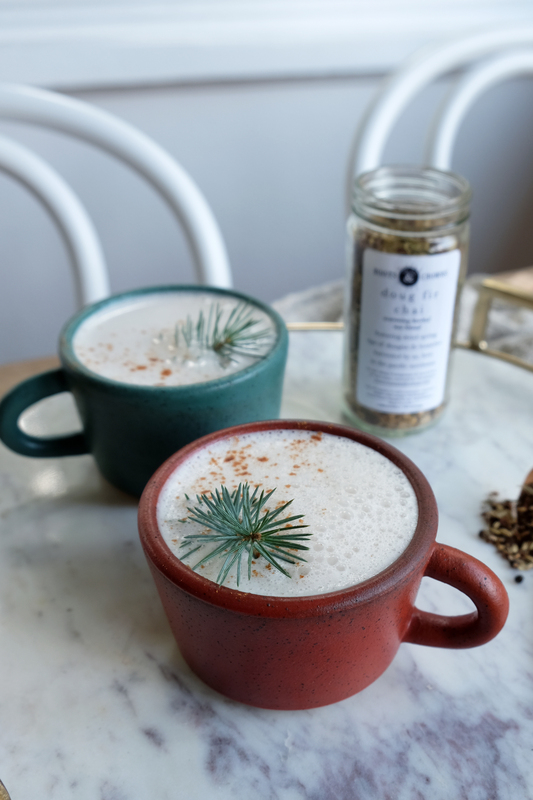 I’m super excited to be partnering with one of my favorite brands, Mountain Rose Herbs, on this post. 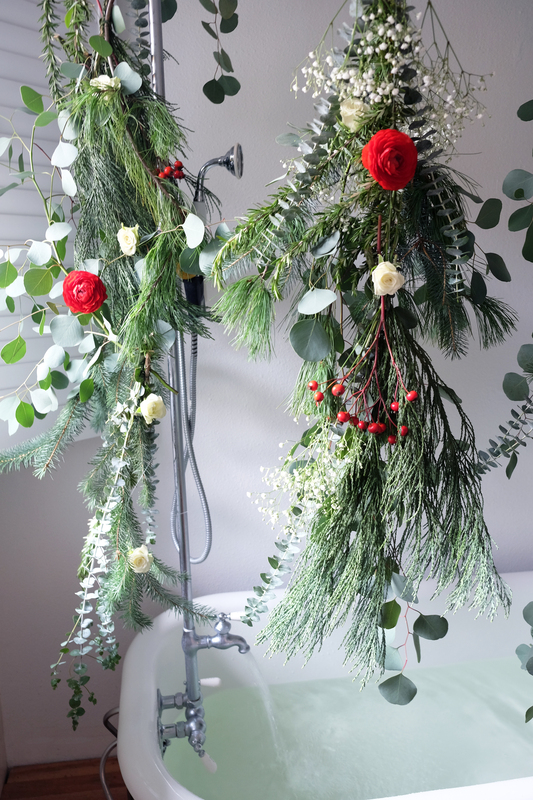 MRH is an amazing resource for all things natural beauty, as well as bulk herbs and spices. 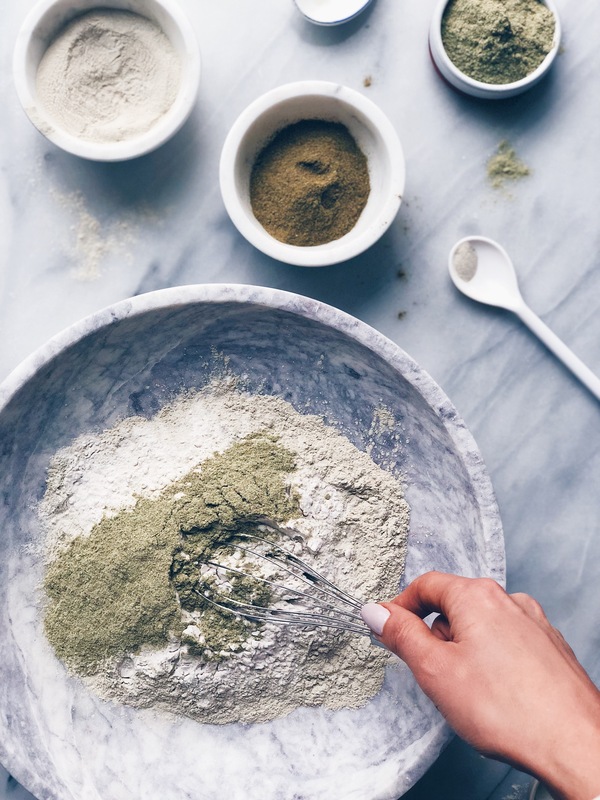 This DIY Dry Shampoo recipe includes nourishing herbs to sooth your scalp and enhance your hair. I’ve included a variation for dry/sensitive/dandruff-prone scalps and one for more oily scalps. If you are brunette, or have darker roots/hair, I recommend adding cacao powder for a darker colored hair powder that will blend in with the natural tones of your hair. I’ve specially crafted 2 scent options for this recipe, but I also encourage you to play around with mixing scents or if you have a blend you love to use that. 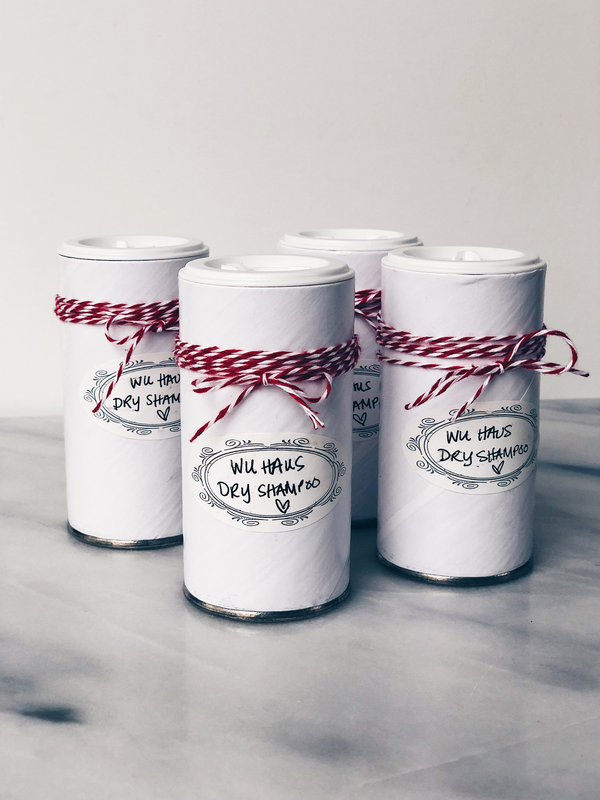 These powder containers from MRH are great for storing your finished dry shampoo, and can be customized with personal labels for the perfect holiday gift idea. You can also use small mason jars if you prefer. Arrowroot Powder: Soaks up excess oil on scalp and hair without over drying. Used over cornstarch because arrowroot is harvested without the use of harsh chemicals or high heat. It is also loaded with beneficial nutrients for the skin. Fuller’s Earth Clay: Fuller’s earth also absorbs excess oil and has astringent properties. It helps to regulate the production of oil and sebum by the hair follicles. Rich in minerals calcium, silica, iron, quartz and magnesium. Yarrow Leaf & Flower Powder: Yarrow is a nourishing herb with anti-inflammatory, antiseptic and astringent properties. It’s a great herbal remedy for treating scalp conditions that may stunt hair growth. It leaves hair feeling soft and manageable. Horsetail Powder: Promotes hair growth. Works especially well for scalp conditions such as dandruff, sensitive skin, inflammation, itchiness and dermatitis. Oatstraw Powder: A good source of silica and magnesium which promote scalp health and hair growth. Optional: For dark colored hair or roots, add 1/2 cup cacao powder. 1.) In a large mixing bowl, whisk all powders for the base together. In a separate small bowl, mix together essential oils. Add essential oils to powder, and whisk well to remove any clumps. 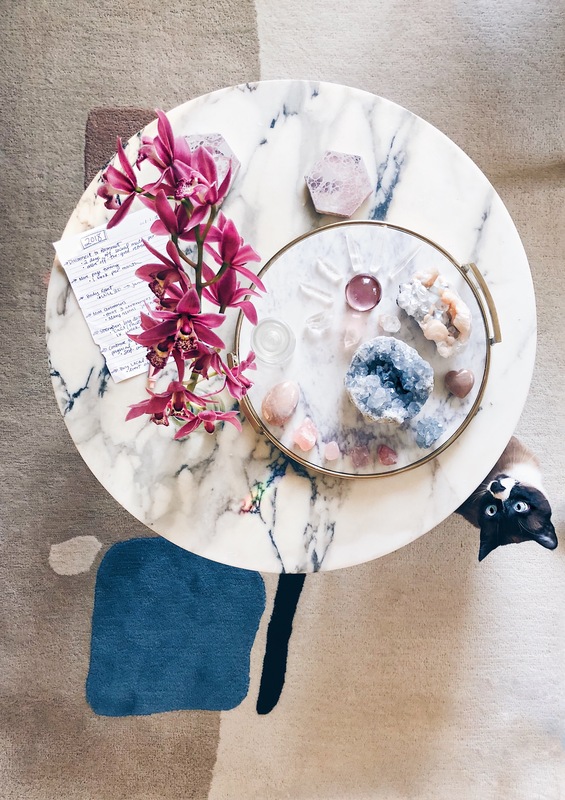 Leave a comment on this blog post with your favorite self-care ritual and the 2 Roots & Crowns products you want to try the most. 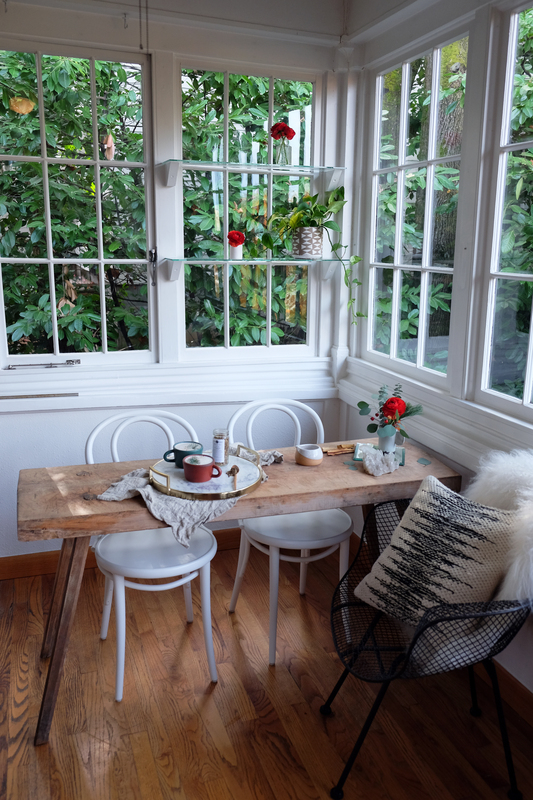 For an extra entry, follow @alison__wu, @rootsandcrownspdx, @alexandriacummingsceramics, @crosbyelements and @profg.co on Instagram and leave an extra comment on this blog post saying so. Contest closes on Tuesday, December 12, 2017 at 11:59PM PST. Winner will be chosen and announced on Wednesday, December 13, 2017. 1.) Using a tea strainer and jar, or just a large mason jar and mesh sieve, steep chai covered for 10 minutes. [Covering while steeping allows for a deeper, richer flavor.] Strain out tea and reserve liquid. 2.) In a high-speed blender, blend chai liquid and all other ingredients on high for 1-2 minutes. 3.) Pour into mugs, sprinkle with cinnamon and enjoy! 1.) Bring the Heat: Whether it’s fires in the fireplace, lighting lots of candles, warm baths, going to the sauna, drinking warm beverages, or cooking with warmer/spicier ingredients – follow your body’s wisdom when it comes to telling you what you can do to nurture the warmth during the cold season. 2.) Mind Your Body: It’s easy to become a little more physically stagnant during the winter months because there’s more of a lethargic energy surrounding daylight and the liveliness of the natural world, but keep moving. Bundle up and get some fresh air. Sweat it out. 3.) But Also, Embrace Rest: Winter is definitely a time for being more introspective and reflective. It’s ok not to feel as social and extend yourself as much as you would do in the lighter months. Just as we see the animals getting quieter and going into hibernation, our spirits crave that slower living during this time as well! 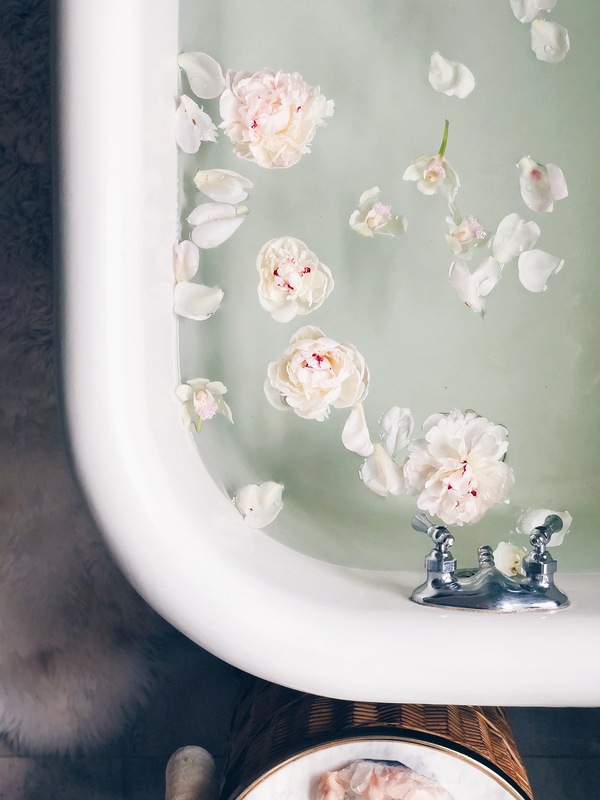 Baths with mineral salts are an age-old remedy for soothing sore muscles, healing skin conditions, improving circulation, and speeding up recovery from illnesses. This bath salt recipe is extra warming and immune-supporting. 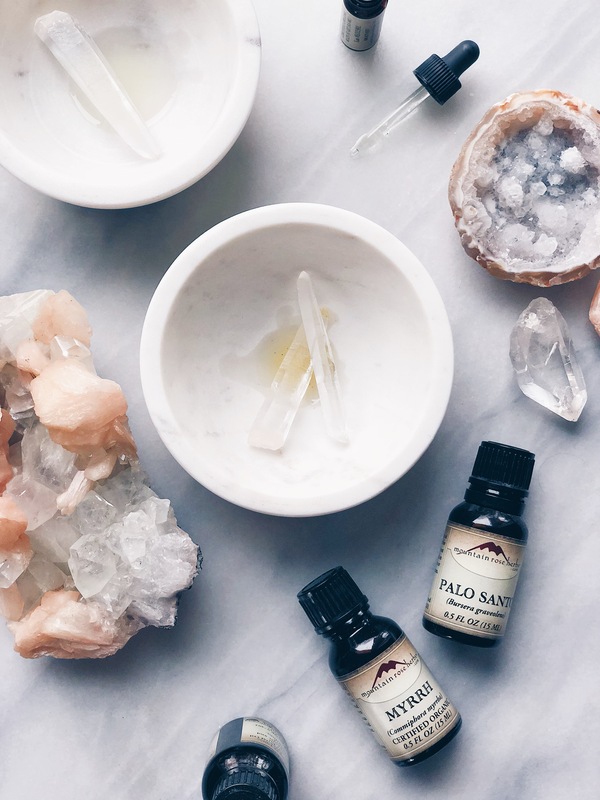 The oils included will help uplift the spirits, open airways for deeper breathing, and also add an anti-microbial, anti-viral aspect of protection for you against seasonal germs. 1.) In a large mixing bowl, add the two different salts. 2.) In a separate small bowl, mix jojoba, coconut or sweet almond oil, then add one drop at a time of the essential oils as follows: 2 drops Eucalyptus, 1 drop Rosemary, 1 drop Clove, 1 drop lemon. Mix well. 3.) Combine oils with salts and mix well so that the oils disperse appropriately. *Dead Sea salts have over 21 minerals in them and are extra yummy for your skin, but if you can’t find Dead Sea salts, you can use 8 oz of epsom salts instead.